This idiosyncratic double CD release sees the music of György Kurtag performed alongside that of some of the major composers from the past seven centuries. It stems from the fertile imagination of Marino Formenti, a member of Klangforum Vienna who has been drawing comparisons with Glenn Gould in recent years as something of a maverick pianist and conductor. Formenti identifies in Kurtag's music 'a quite nearly obsessive relationship with our common musical tradition'. Given that that tradition at its base is the result of a blind, unaccountable obsession he is right, though not in the sense he intends. Kurtag's Ghosts, billed as 'a fascinating musical expedition in seventy compositions', leaves one wondering what the trajectory is. It starts out in muted fashion, with a couple of piano transcriptions from Mauchaut whisperingly traced in pp. This acts as an Introit to the project as a whole. Some of the juxtapositions thrown up are unexpected and pleasing. The initial fall down the proverbial musical rabbit-hole into the wonderland of the western tradition, initiated by way of Mauchaut and Farkas Ferenc, soon lights across the jagged forms of Stockhausen's Klavierstück II and Messiaen's Île de Feu. Formenti's playing in this repertoire is livid with animation. Kurtag's Hommage à Pierre Boulez renders the Frenchman's spirit in facsimile through acute phrases and leaps, its length of two minutes preferable to the extended dirge of Structures 1a. One is afforded the opportunity to hear with fresh ears material one may not have visited in a while. Extracts from Boulez's Notations, for example, are cast in impressive dramatic contours, with a corridor then suddenly thrown off them into Modest Mussorgsky's brilliant Catacombs. Kurtag's own homage to the Russian follows it down this corridor in transformed apparel, the succession coming to the listener like Monet studies of a cathedral under different light. Equally and perhaps inevitably however some of the meetings are less happy. A prelude from the Well Tempered Clavier, ambling along nicely on its way, suddenly without pause lurches into the atonal territory of some recent Kurtag, in a drunken sort of gesture loosing its gait and falling about a bit before breaking back into some Haydn, seemingly recovered sufficiently to brush the dirt off and look dignified again (hopefully nobody saw). Likewise the pairing of Kurtag with Schumann – one would think one of the more important meetings of the project – is made negligible through Formenti's heavy-handed delivery; parts eight and nine of the Davidbündlertänze unfortunately made garish to match the aggressive Kurtag miniatures that bookend them (Face to Face and Nyuszicsököny). 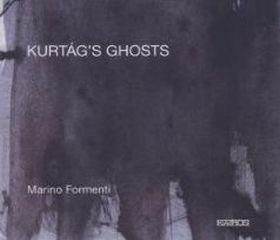 Kurtag's Ghosts works most effectively when the listener submits their imagination and forgets about what they might prefer to be listening to. It takes some readjustment to figure out how to listen: should one follow the different composers in the programme, or simply allow the anachronistic stream of music wash over the mind? Some composers stand better in the tide than others. Schubert's position as arch-purveyor of melody is confirmed – his Ungarische Melodie D817 one of the highlights of CD1. Likewise Lizst's short At Richard Wager's Grave expands to fill the acoustic arena. In the more interesting works included, Formenti's over-arching concept momentarily fades out, leaving the listener enveloped in the world of an individual piece. Purcell's Round O Z.T 684 and Kurtag's In memoriam András Mihály both open up such an enchanting space. These are the more decisive moments, the minor ones, that throw off the grand design in favour of their own more elusive signature, and which are perhaps more in kinship with Kurtag’s music than is the loud concept of the whole. In attempting to conjure the western tradition as a whole, the release is as ahistorical as it is historical, ignoring the singularity that produced each work in the first place. At the close of disc one, Ligeti's Musica Ricercata n.8 sets off a medley of Hungarian-tinged works to race to the finish in a crowd-pleasing finale. The second disc is more subdued, and finishes by way of an overwrought funereal section. Here the struggle between Romanticism and Modernism, implicit throughout the work, reaches an apogee. Romanticism appears to win out through the thick fog of solemn introspection (veritably screaming: 'This is a memorial to the past'). We realise at this point that the project had been a Romantic one from the outset, with Kurtag assuming the role Beethoven has traditionally filled – the tragic-heroic composer who takes on our burden, allegorically embodying our relation to music. The music after all is thoroughly programmatic in charge, a fact that mars the listening experience for me. And even if we were to say the project is more a synthesis of the Romantic and the Modern through the music of Kurtag, that’s still a Romantic idea. What is interesting is what is left out of the synthesis – no Mozart or Debussy for example; the length of a composer's works having a bearing upon the reading of music history. What escapes the tragic-heroic marriage of the present and the past perhaps does so at the proper behest of music, which is after all what never speaks and is omnipresent as what goes without saying throughout. Gripes notwithstanding, the release as a whole is decent and Formenti should be commended for his creative approach. As each listener finds their own way through the labyrinth of music history (or not), so they will find their own way through this listening experience and register their own thoughts about it afterwards. If in the end overly backwards-faced, Kurtag's Ghosts is still an intriguing release and will doubtless remain so in years to come.